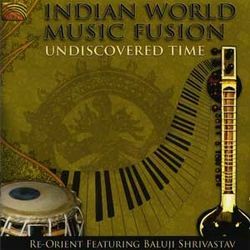 Long-time world music specialists ARC Music have sent me through an album called “Undiscovered Time” (Indian world music fusion) by the band Re-Orient (EUCD 2371). The trio consists of multi-instrumentalist Baluji Shrivastav and singer-songwriter/poet Linda Shanovitch alongside another multi-instrumentalist (and uber-prolific album releaser - 80 albums to date), Chris Conway. Each member has contributed their own compositions to the 10 tracks on the CD (three by Chris, three by Linda, two by Baluji and a couple of joint works) and as you’d expect they tend to each emphasise different facets of the fusions. Baluji draws more from the raags and the classical Indian music tradition, Linda’s from jazz and ballads and poetry with a sparser and more reflective nature, whilst Chris tends to have a more overall balanced fusion of flavours spent from years of experimenting with ingredients and fiddling with menus in the world music kitchens. Global Reunion feels like the soundtrack to a film and is an uplifting theme to introduce the disparate members of the band as they re-unite for this new album. Brave Boy is more of a straightforward midnight jazz ballad, real torch-song stuff for the end of the night when the audience have all gone… Very sad lyrics, deepened further by Junkes’s weeping sax and Baluji’s mournful dilruba. Portrait of a Swan is a fairly straight meeting of jazz and Indian tarana in Raag Hansadhwani mode featuring the sax and sitar. The Gift of Time is a form of Indo-Irish ballad and Dangerous Ground a slow bossa with flamenco undertones featuring a solo on the strange sounding gopichand (a one string plucked instrument). Celebration cracks along in a joyous vein with elements of Brazilian nordestino pifano music set against Indian bols, kalimba, crows, monkeys and a global background of sounds. Tides is another meditative piece featuring Linda’s words and vocals and the rather otherworldly sounds of the theremin, gentle ostinatos and the sound of the waves. The Long Summer is a piece inspired by Balkan music in ⅝ time yet is more akin to Brazilian jazz in the vocals. Celestial, which draws inspiration from the Bhagavad Gita, is as spacy and ethereal as the name implies, whilst Garland of Light is a floaty collective improvisation utilising their three very different vocal sounds. Interestingly, the whole album hangs together surprisingly well, given the amount of influences, the plethora of instruments, the different backgrounds of the members and the highly collaborative nature of the work. It’s not an easy thing to pull off. We’re often used to the concept of a dominant musician or producer having an idea and dragging everyone else along in the direction they want (sometimes necessary to bring a vision to life), but that this album works as well as it does I can only attribute to Re-Orient’s ability to really listen to each other, support and co-create. After 20 years I suppose they’ve got the right fusion after all.